You could hear the murmur of the New England crowd when the Colts defense held the Patriots to a field goal midway through the 4th quarter, giving them a 31-14 lead with 10:23 to go in the game. Why were they concerned? Because they were very uneasy about having only a 17 point lead with that much time left. That is how much Peyton Manning has gotten into the psyche of the New England fans. Their concerns were justified as Manning lead the Colts to two consecutive scoring drives to close the lead to three points. The defense was solid all of the 2nd half, correctly some of the horrific tackling that allowed the Patriots to get a few additional yards on virtually ever play in the first half. In the end all of the work of the Colts came to naught as Manning was fooled into throwing an easy pick to end their chances. 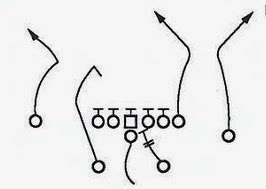 Multiple times Sunday night Manning was fooled by a clever defensive scheme that made a cover three defense look like a cover two. On four Occasions manning threw deep to the right side into the teeth of the secondary; getting two picked off. At least one of these was on play action, so perhaps having his eyes away from the secondary was a factor. It should be noted that the Colts would not have been in this game were it not for the great job Manning did in bringing them back. This after the defense put the Colts in a hole, allowing three touchdown drives in the first half and one in the third quarter. Austin Collie (who I thought was the key to the game) seemingly suffered another concussion on a long catch and run in the first quarter on what looked to be an unpenalized cheap shot by Brandon Meriweather. Meriweather drove his shoulder directly into Collie's helmet while he was being held up by another defensive back. Going after the head of a player who had suffered a severe concussion a couple of weeks before was either a happy accident for the Patriots or a planned strategy by the same team that let Rodney Harrison cheap shot players week after week. Tom Brady played his normal game against the Colts - strong first half, timid and shaky in the 2nd half. The Colts went from their usual zone defense in the first half to a tight man to man in the 2nd half - daring the Patriots receivers to beat them. This strategy worked and the Patriots will probably see that again over the next few weeks unless they show that they can defeat it. All in all, the game went better than I thought it would. After losing Collie early, the Colts were able to scramble to more points than I thought was possible. Patriots kicked a field goal to go up 31-14 with 10:23 left it the 4th, not 4:55. Peyton hasn't gotten into the psyche of the Patriots fans. He has always been good. Pats fans just know that they have the very close to the worst defense in the league. Bottom rankings in points allowed, pass yards allowed, and middle of the road for rush yards allowed. Nothing I like better than a debate with a completely unbiased observer. Thanks for dropping by. If it was truly dirty, surely the Colts would have shown the tape to the league and we'll see a fine for Meriweather on Friday. Hopefully that won't be the case as I believe it was incidental. I think it was within the rules. I also think it was an action designed to injure an opposing player. In other words - dirty. Just think about it this way, I can guarantee you that Meriweather was watching that Colts Eagles game where Austin Collie was laid out stiff as a board on the field - everyone from the announcers, players, and people at home concerned he might be dead or permanently injured. He was watching that game. Then two weeks later, the very first time he had the change he drove his shoulder into the head of the very same helpless player. He was tackled. Meriweather did not just run into him, he gathered himself and drove his shoulder into his head. If he was delivering a normal blow, he would had had his pad level MUCH lower. Meriweather did not hit or otherwise try to tackle anyone else in such an unsound vertical posture. Knowing all of that, how do you feel about your boy now? BTW, Collie is about the most inoffense guy you will ever meet. He is a former Mormon missionary and has a young wife and child. That is the PERSON that Meriweather was trying to inflict a BRAIN injury on. So, by all means tell me all about how it was a good play and that it was not outside the rules. Go ahead, please tell us how great he is and how he is your boy. There are rule of human behavior that go beyond football, strange how your team seems to collect players who don't understand that. ^^ THAT is a homer post if there ever was one. When you are talking about hard hits in general, we have nothing to argue about. So, I am not sure why you are making arguments supporting a position that I completely agree with. What I was talking about was a deliberate attempt by one player to injure the BRAIN of another player. It has always been considered unthinkable to try to go after a previously damaged knee or something like that. I'm sure if you cannot understand that concept for some unknown reason, just imagine someone purposely sticking a helmet into Brady's surgically repaired knee as part of an "incidental, but really on purpose" hit. If I put it that way, does it seem like a bad thing now? Why is it only Pats fans that you have to put things into baby talk? Of course we are not talking about something as minor as a knee, are we? No, this is the BRAIN of a guy in his early 20's. Would you be cheering Meriweather for ending the functional life of a player with a hit that, while legal, was calculated to render him unable to play? Do I really need to list out all of the former all-pro football players out there whose lives are severely compromised due to head injuries? Isn't there a time when you can say that something is bigger than being a fan and supporting your team? Shame on you. Unless you would have the SAME opinion about Harrison of the Steelers taking out Brady's knee with a legal hit on purpose - and be totally fine with it because Brady took the field. Shame on you. That fact that you excuse his behavior because he is on your team is sick. Shame on you. Sorry, I really didn't see it as head hunting. Those are the kinds of impacts they have to be able to withstand throughout the course of play. That is one reason why I don't think it was anyting to get upset about. And why I think if he was that shook up over the hit maybe he wasn't ready to come back yet. Dispite what you may believe, I am not one to wish harm to opposing team players. Those tackles happen so fast and the tackler and (for lack of a better word) tackl-ee are in motion. Intent is hard to judge also. Any defender going to *any* QB's knees is typically dirty because that is against the rules. Especially if you see it was an extra effort to do so. But if the defender was in motion (say all ready diving), the QB moves enough and as a result the defender then lands in the knee(s), then well, yah penalty by rule, but not dirty. I think we agree in general - but not on this particualr play.